While having the foundation set for a new home or building is typically not as exciting as watching walls go up, the roof go on, or moving furniture in – it is probably the most important step in construction. The foundation holds and supports the entire weight of any structure, so taking the time and means necessary to ensure that it is properly constructed will benefit you greatly in the long run. 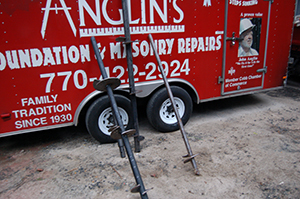 Anglin’s Foundation & Masonry Repairs has been in business since 1930, giving us 86 years of experience and development of a proprietary system of connecting the pier bracket to the foundation. Unlike many foundation contractors, we do not drill into the concrete foundation for the sake of attaching a pier bracket. Drilling into the foundation can damage or crack the concrete footing, leaving the entire structure vulnerable from the very start. Anglin’s Foundation & Masonry Repairs is a full service contractor serving homeowners and business owners throughout the greater Atlanta metropolitan area. We have the skill, knowledge, and expertise required to provide stable foundations that last for a lifetime. Georgia is infamous for its red clay, and it is this red clay (along with buried debris, muck, and sinkholes) that has the potential to damage and threaten the foundation of your structure. Anglin’s Foundation & Masonry Repairs is the name to trust when it comes to installing a foundation. We install a deep foundation system prior to building your home or commercial structure in order to ensure that it will rest on a solid base and will remain stable for many years to come. Before you begin the building process, please contact Anglin’s Foundation & Masonry Repairs in Atlanta. We use only the highest materials for all foundation projects, and we stand behind our work with a lifetime guarantee. Please contact our office for more information about our services or to get a free quote. Our number is (770) 422-2924 – which hasn’t changed in over 40 years!